The most popular Jodhpur festival is the Jodhpur Marwar Festival. It is held every year in memory of the heroes of Rajasthan. Marwar Festival of Jodhpur, Rajasthan was originally known as the Maand Festival. The festival is held in the month of Ashwin. Ashwin is a Hindu month between September-October. The Marwar festival in Jodhpur, India is celebrated during the full moon of Sharad Poornima. It goes on for two days. The main attraction of this festival is the folk music centered on the romantic lifestyle of Rajasthan's rulers. 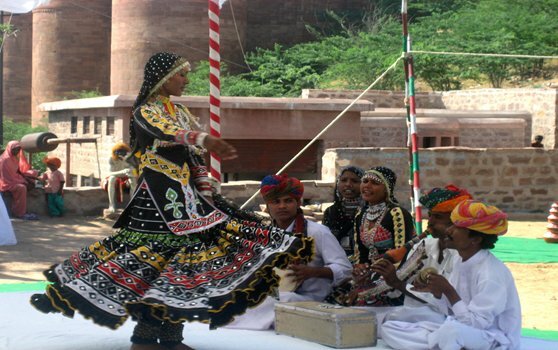 The music and dance of the Marwar region is the main theme of this festival. The folk dancers and singers assemble at the festival and provide lively entertainment. These folk artists give others a peek into the days of yore, of battles and of the heroes who still live on through their songs. Among other attractions at the festival, is the camel tattoo show and polo. The venue of this festival includes the famous Umaid Bhawan Palace, Mandore and Mehrangarh Fort.